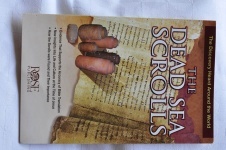 This handy Bible sized fold-out on the Dead Sea Scrolls covers all the basic information needed to understand the significance of the discovery of the Dead Sea Scrolls. This fold-out answers your questions about the Dead Sea Scrolls, such as: What specifically are the Dead Sea Scrolls? What do the Scrolls tell us about the Old Testament? What do the Scrolls reveal about Early Christianity?